Every watch comes with an original leather strap which is already included in the price. If you want to add a metal strap, you can choose between 19, 20, 22, and 24 mm bandwidth in polished, brushed or matt stainless steel. The metal straps are made in a very high and massive quality. Manual winding, 23 jewels, autocompensating spring, monometallic balance wheel, 30-minute counter, shock protection, 21.600 half-rotations per hour, date indicator with fast-setting, 45 hours power reserve. This caliber is nearly identical with the famous Swiss Valjoux-7734 caliber. Poljot Kaliber 2612.1. The rattling alarm noice ( ca. 13 sec ) ) is produced by a small hammer which rattles against the watchback. The calibers features 18 jewels, shock protection, 18.000 half rotations per hour, 2 seperate springs for time and alarm , monometallic balance wheel. 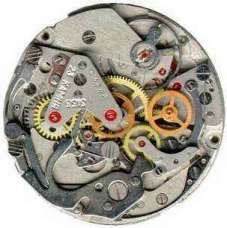 Molnija Pocketwatch caliber 3603/3105: ( works in many russ. 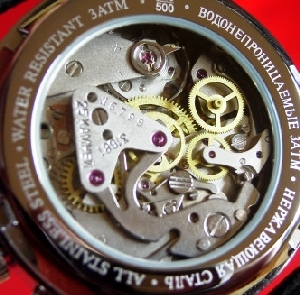 wristwatches ) manual winding with 41 hours power reserve, shock protection, 18.000 half-rotations per hour, decorated caliber with blue screws, 18 jewels. 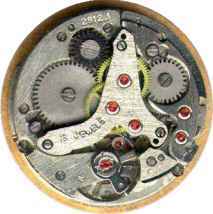 Poljot caliber "2614" Manual winding caliber, 17 jewels, shock protection, 21.600 half-rotations per hour, date indicator with fast-setting, 42 hours power resreve. ETA Automatic-caliber "2824" automatic winding , 25 jewels, shock protection, 28.800 half-rotations per hour, power reserve 42 hours, date indicator with fast setting. Wostok Automatikkaliber "2416" automatic winding , 31 jewels, shock protection, 19.800 half-rotations per hour, power reserve 31 hours, date indicator with fast setting.